If you have 92 cents, take a trip to your local Wal-Mart to pick up a pop mold for this super simple and fruity recipe with some ingredients you probably already have in the refrigerator. Or, if you'd prefer to use different sizes or shapes, check out places like Target, Bed Bath & Beyond or Amazon. You can find Orange Blossom Water in Wal-Mart as well, on-line at https://www.olivenation.com, or in the aisles of Middle Eastern Supermarkets. Using this ingredient gives the unique taste of an orange grove to this recipe. This fantastic dessert is perfect to cool things off on a hot day, or to use as a fun project with the kids. 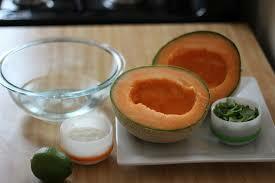 Combine all the ingredients in a blender or food processor, blending until smooth. Adjust the flavors for your level of sweetness, by adding more honey, slowly. Pour everything into frozen pop molds, and freeze until completely solid, at least 6 hours or overnight. Every once in a while, I can find really good deals on those laundry packets that dissolve in the washing machine, but according to Good Housekeeping, all are not created equal. During their tests they found that the quickest dissolving packs were Ajax ProPax Single Dose Laundry Detergent Powder, and Target's Up & Up Green Meadow Detergent Liquid. They also give their Good Housekeeping Seal Holder to Tide Pods Original. Wow! 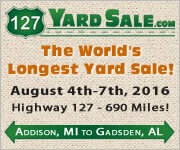 Can you imagine close to 700 miles of yard sale hopping? If shopping for deals is your passion, put on your walking shoes and head out to The World's Longest Yard Sale from August 4 - 7, 2016. This extravaganza mostly covers HWY 127 through the states of Michigan, Kentucky, Ohio, Tennessee, Georgia and Alabama. This is also a great way to earn some extra cash by being a vendor at this large event. Check out http://www.127yardsale.com/ for more info. It's been a week since the horrific tragedy in Orlando, FL,and I can't help reliving the sadness of it all over and over again. I keep seeing visions of unanswered texts, hearing ringing phones, victims carried with blood, and whispers of fear in a crowded bathroom. In addition to many lifestyle topics, this blog is also about supporting victims/survivors of domestic violence. The irony is that we bow our heads in silence as a show of support for friends, family and strangers who have died, yet needless crimes of violence such as gang wars, acts of hate, physical abuse, bullying, murders continue. No truer statement was made than this song, "What the World Needs Now is Love". I bought some popsicle molds a few months ago and have been making all kinds of fruit popsicles. The watermelon was the best one so far. Yum. Love cantaloupes! Might've to try that recipe. as for the Orlando murders hmmmmm, pure madness. 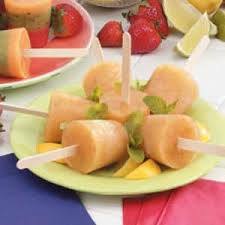 I would have never thought to use cantalope as a frozen fruit pop flavor. Thanks for this. Hey, I didn't realize such a cool garage sale went through close to where I live. I'll have to catch some of that. That is so true--we mourn the victims of mass murder but we don't mourn those who are killed each weekend in our own cities. They showed the video from inside the bathroom on the news...I wish I hadn't seen that! I'm just glad it was grainy and dark because if it had been easy to see in there, I probably would have been haunted by those visions. I'm always intrigued by the yard sale and I know it ends somewhere near me but I've never been. I think it'd be fun to go to a couple. Those popsicles sounds amazing. I'm a big cantaloupe fan and I think the mint and orange water with it sound amazing! A great, tasty treat for the summer! Thanks for the post. Hmm interesting on the pods. Never would have thought about it!